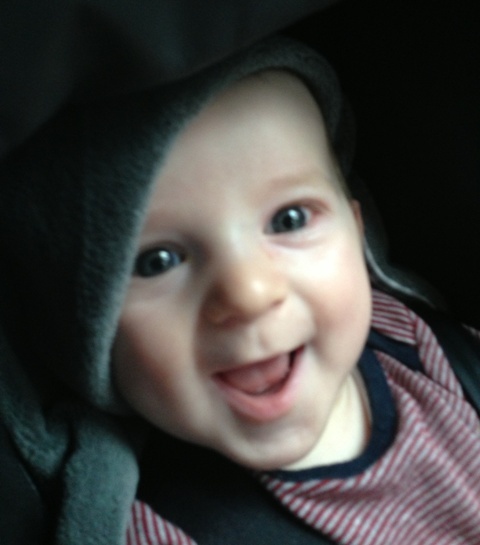 Today I’m pleased to introduce you to my sweet little grandson Felix. He is now 6 months old and growing up into a lovely little boy. I can’t wait to sew some fabulous boys outfits for him! If you have any favourite baby boys patterns let me know! Little Poppy is growing up! My little granddaughter Poppy is growing up and so very sweet! I have been working on a brand new baby and toddler design which I’m sure Poppy will just love as well as all you baby sewers out there. I am currently designing a brand new baby pattern. Some of the students here at Rosewood have seen my test designs and are already eager to make this pattern for their little ones! Are you currently working on any baby sewing projects? Leave me a comment below I would love to hear your inspiration! 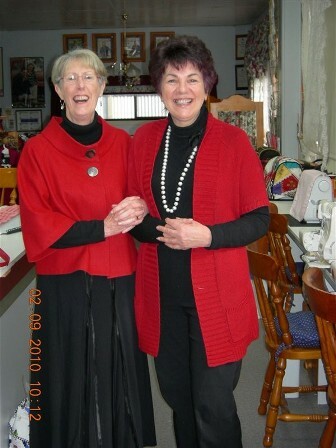 Student News from Maree’s Sewing Classes! I have such a great time teaching sewing in my sewing school at Rosewood Cottage that I wanted to share with you some pictures of what a few of my students have been working on recently! Below Sally worked on a great sewing project of hers - ‘A tailored jacket’. This is a classic style with 3/4 length sleeves, centre back and princess line seams. The fabric used was a blue denim marle linen. 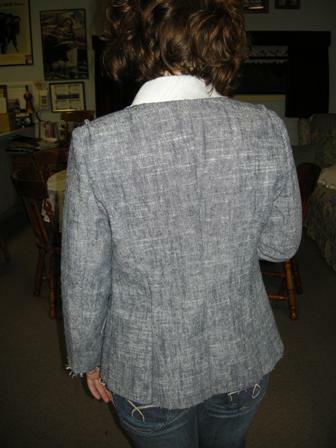 Back View of Sally’s tailored jacket in the making. 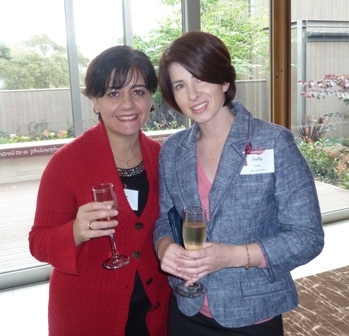 Sally (right) wears her finished jacket to my High Tea Party and is pictured here with another one of my sewing students Rose (left). As you can see, Sally finished her jacket with a fine blue ribbon stitched close to the outer edges of the collar, sleeve and pockets. 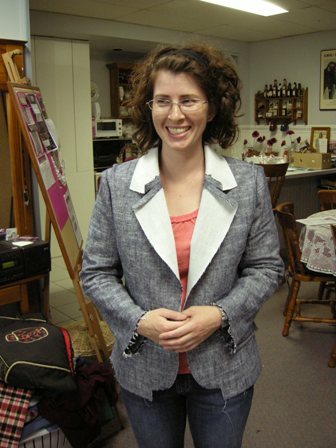 Sally lined this jacket with a gorgeous blue and white floral printed cotton! Great Job Sally! More sewing for Baby! Here Kay makes a gorgeous little outfit for her granddaughter Milli! 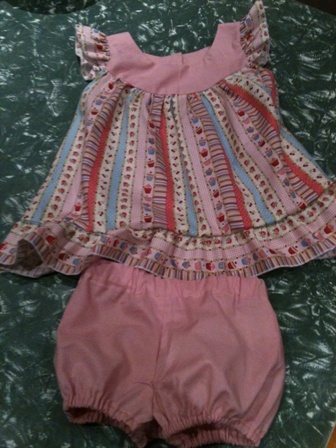 Kay made this sun dress from a pink and white gingham fabric. She rolled edge the top edge of the dress with a 3 thread overlocker and shirred the bodice using shirring elastic. Then Kay trimmed the hemline with guipure lace daisies and stitched two on the bodice. It also features fine elasticized shoulder straps! Great job Kay! 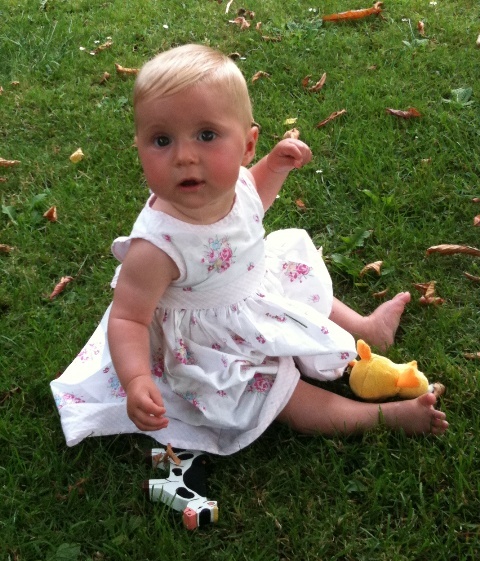 Anna made this cute little outfit below for her friend’s little girl from Pattern McCalls 5835 view A & E size 1. Anna learnt how to pattern match the prints used in the dress, how to cut the most desired part of the fabric to make frills using a rolled edge on the overlocker. Anna coordinated her fabrics to make the matching bloomers! Below Penny is showing us all one of her new sewing folders. Penny has a terrific collection of folders where she has photo copies of all her pattern covers and has put them into various categories. Therefore when Penny is looking for inspiration she can simply browse through her own catalogue! So convenient! I hope you have enjoyed this blog post which featured some student sewing news! If you would like to learn how to sew contact me today! If you liked this blog post please leave me a comment below as I would love to hear from YOU! !